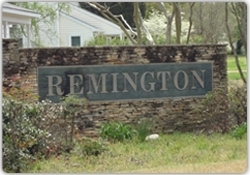 Remington is an extremely affordable subdivision tucked away in downtown Holly Springs, by Town Hall. Remington is located off Raleigh street and the main entrance coming in is Steeple. This development started in the early 1990's and didn't take long to sell out. Holly Springs doesn't have a lot of affordable single story homes. Most of the homes in Remington are ranches and the homes range from 1,100-1,400 sf. Prices range from $170-$260K. Very affordable seeing that most of the homes sit on large 1/4 acre lots. A great benefit of living downtown is you are close to everything. There is a Farmer Market during the summer on Saturdays. You're also close to the Cultural Center/Library, Hunt Center, Churches. Parks and the many restaurants and shopping.